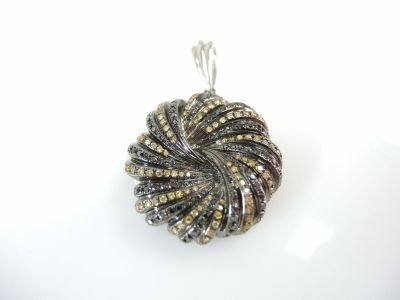 One 18 karat oxidized gold circular swirl motif pendant. 117 round brilliant cut diamonds (0.66 carats: black colour). 104 round brilliant cut diamonds (0.51 carats: SI clarity: medium fancy yellow colour).